This recipe comes from the Delia Bible, the Complete Illustrated Cookery Course by Delia Smith. Yes she can be a bit annoying and sometimes her portion sizes are a bit mean, but I love Delia anyway. Her recipes always work! A large nylon sieve and a piece of chemists gauze about 14 inches (35cm) square. Wash the blackberries and place in a thick based saucepan with the water. Then stew them very gently with a lid on for about 20-25 minutes. 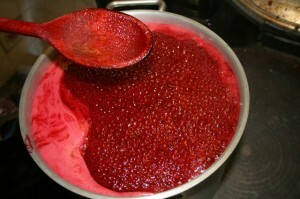 Now and then give them a good mash to reduce them to a pulp and squeeze as much juice out of them as possible. After that add the sugar and lemon juice to the pan and allow the sugar to dissolve completely with the heat still low. There must not be any whole granules of sugar left. This takes about 10-15 minutes. Now turn the heat right up and boil fairly rapidly for 8 minutes, stirring now and then to prevent sticking. Meanwhile, warm a large bowl and a 1lb (450g) jam jar* in the oven and get them nice and hot. Then, using a wooden spoon, get all the liquid through as quickly as possible, squeezing the remaining pulp as much as you can - but do be quick as the jelly sets if you take too long. Now pour the jelly into the warmed jar, cover with a waxed disc*, cool and tie down. If it begins to set before you've had a chance to pour it into the jar, just reheat it gently. I actually used 2 smaller jars when I made this. Also my sieve was stainless steel not nylon and when I tried to use the gauze I couldn't get the mixture through it so end up just pushing the mixture through the sieve minus the gauze. It worked fine so I won't bother with the gauze at all next time. Preserve recipes always recommend the use of waxed discs but I always just use the jar's original lid. If you've washed it thoroughly and then the put it to dry out in the oven with the jar it seems to be fine. I've never had a problem with my jam or chutney going mouldy... and I've kept some for a very long time!